Afghan government forces have pushed back the Taliban from Farah city, the capital of Farah Province in western Afghanistan, close to the Iranian border, Afghan officials say. 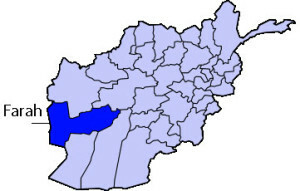 The attack, the first major assault targeting a provincial capital since the Taliban announced its annual spring offensive, began early on May 15 when several security checkpoints were overrun after midnight, with the militants capturing one urban district and parts of another. Special police forces from Kandahar and commandos from Herat were also deployed in Farah, Afghan officials said, as heavy fighting continued through May 15. Afghan and NATO warplanes bombed Taliban positions after the insurgents’ assault on the city. Defense Ministry spokesman Mohammad Radmanish said 11 soldiers were killed in the fighting. Previously Radmanish and NATO had said “dozens” of militants died in the fighting. Farah provincial governor Abdul Basir Salangi and Interior Ministry spokesman Najib Danish gave far higher tolls. Danish said 300 Taliban had been killed, although Salangi said the wounded had also been included in the 300 toll. Nasir Mehri, a spokesman for Salangi, said at least five civilians had been killed. TO KEEP DOING THAT ???? ?